Scientists have done their best to help correct the defects of the human eyes. But the inner eye needs individual effort to be effectively deployed. A lot of us have bright eyes but actually lack inner eyes. Some people look but don’t see. Statistics reveals that divorce is indeed on the rise. A lot of couples enter into marriage looking and concentrating on the wrong things especially the physical. Some men are carried away by the sophisticated endowment of women, while some women are indeed swept away and their brains fingered by the TDH (Tall, Dark, Handsome) nature of some men, impeccable dentition, flawless diction, captivating smile, exceptional caring attitude, undivided attention, wow dress sense characterized by fantastic neatness but never looking beyond what eyes can behold. Reality however dawns on them when the knot is eventually tied. The good physical qualities that got them excited before the marriage cannot however make up for the internal flaws which they fail to see using the power of their inner eyes. Celebrities are the worst hit in this quagmire of divorce. They are too busy to look beyond the fame, glamour and prestige attached to celebrities. Hence, they end up been overwhelmed by the partner’s inadequacies because they fail to use their inner eyes. A lot of people smile, but with hidden pain, some care but with hidden jealousy and hatred, some pray but with laden curses, others render help but with hidden anger, some weep with you, but with in-depth joy and happiness, however, some show love to you, but with hidden agenda of plotting your downfall. So it takes an individual with an inner eyes to be able to discern and not be swept by the physicality. Goliath was brainwashed by the physical stature of David. He, being huge and strong was confident in his physical stature and his weapon of battle. On the other hand, David –a boy with a very small stature; in comparison with Goliath can be likened to a full grown man and a baby. This made Goliath believe that David would be a walk-over for him. He was so confident that David would be destroyed within seconds. He was embarrassed and deluded by the physicality, lacking the power of the inner eyes that will enable him look beyond David’s stature to look inwards. Goliath was only looking, but not seeing. Practically, he should have looked beyond David’s stature and reasoned it out that there should be more to David’s stature for him to be confident enough to confront him in battle. He however died as a result of his lack of inner eyes. The Biblical Samson was an exceptional man who was bestowed with extraordinary power. He was adjudged to be the most powerful man in human history. Basically, a powerful man may have eyes but not inner eyes. Samson’s extraordinary powers didn’t make up for his ability to see things beyond the physical. He left his territory to seek for a woman from a country that was labelled as an enemy of the nation. He went down to Timnath and saw a woman- one of the daughters of the Philistines. Note that he only saw that lady. No close interaction, no proximal study. He was only in tune with the physical. When challenged by his parents to look elsewhere, he replied by saying-“she pleaseth me well”. The same goes for Delilah, Samson never looked beyond what was appealing to his eyes about her, he quickly fell for her without looking inwards. The adjudged most powerful man who ever lived on the surface of the earth never wore his thinking cap when Delilah was pressurizing him on the source of his great strength. Realistically, he was supposed to think beyond what she was saying, and try to ponder on why she was insisting on knowing the source of his strength. Using the power of his inner eyes to pierce into her intentions would have saved him from his premature, shameful exit. At a point in David’s life, when Saul was ceaselessly after his life, he had to escape to the land of the philistines. He was however given an opportunity to dwell with Achish. Achish was carried away by David’s seeming loyalty. He performed atrocities by utterly destroying Geshurites, Gezrites and the Amelikites for no cogent reason. But Achish was ignorant of these because he focused more on what he could notice physically about him to the extent that he likened him to an angel of God. How can a merciless killer like David in this context be likened to an angel of God? The snag is that Achish didn’t take time to look beyond his superficial loyalty, his calm and sweet words. He was deluded and he lacked the power of the inner eyes. 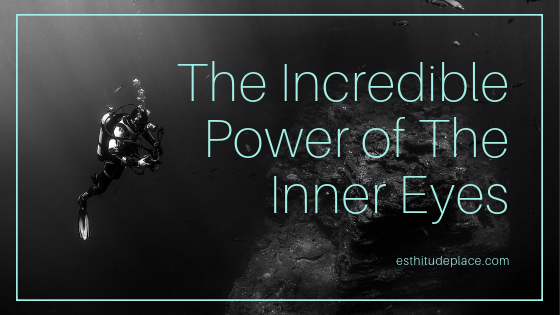 There are lots of things that can be known if the inner eyes is effectively used because it helps individuals to see and discover more of those things that can’t be revealed or seen physically. A lot of things are concealed and until you move beyond the physical, you might just be deluded and also bask in the unrealistic perception. It is however imperative to note that many people are now in the deepest pit of regret because they focused more on the outward, they failed to go further. Dear friends, be patient, take your time to study people; talk less. A talkative cannot listen let alone study people. Time is spent pouring out words. Go beyond hearing, take your time to listen effectively, this will enable you to read in between the lines and also pierce into their real intention through their words. Never be hasty to conclude on people or judge them based on an action or a first impression. Don’t be carried away by a good gesture thinking that that’s who they are. Seek to know the real reasons behind an action, seek to know the motive behind an utterance or a smile. Above all, pray to God for a discerning spirit to be able to see beyond the physical. Nice piece.. Inner eye singled you out from others..
people need to discover themselves,be determined,focused and prayerful. Amen. Thanks for reading through. thanks Mathron for reading through. This is impactful.., more of God’s wisdom sir. …..Tunning and Staying at the Holy Spirit’s Frequency at all times,. 24/7, @360 degrees.. This is beautiful!!! May the good Lord grant you more wisdom from above. A little thing to add, the inner eyes belong to those that are of the Spirit of God,the Spirit of Christ, the Holy Spirit – 1Cor.2:11-16. We should always seek the will of God in all things. Once again I love your write up, keep at it, it shall be well. Pst. Aladelusi. Loaded…. D need for discerning spirit can never be over emphasized. thanks for reading through Olufunmilayo..